When you have a broken beyond repair, or it’s too old and malfunctioning, you may need a lock replacement services. In like manner, perhaps you would like to upgrade the security of your home and install a better locking system. No one doubt that repairing a lock is cheaper than replacing the entire lock, but sometimes the only option available to fix a problem with your lock is to replace it. We are your lock replacement local locksmiths in Easton, PA.
Locks do get wear and tare, and if you consider the people and the assets your locks are protecting, it only makes sense to invest on quality locks and security hardware. Knowing when is the right time to replace your locks could save you time and money. You can save your time avoiding lockout situations, and save your money avoiding calling emergency locksmith or burglary attempts. If you haven’t changed your locks in a while, it may be the time to replace your locks without delay. We offer lock replacement services for both, residential and commercial clients. Residential locksmith services are quite different than a commercial locksmith services. Whether you live in a house or an apartment, we can provide any lock replacement services that you may need. Our locksmiths at LockTech24/7, are more than qualified to handle any lock replacement job for residential or commercial clients. We serve the entire Lehigh Valley PA and surrounding areas. If you’ve moved into a new home in Easton, you may want to replace the door locks for security purpose. It’s important to remember, when you choose to replace an old lock, most of the times, it may lead to better security. Not to mention an old lock is vulnerable. Because we are driving a full equipped mobile locksmith shop, we also stock wide range of inventory with all types of locks available in the U.S market today. We’ve got your lock, and we ready to install it on your door. It doesn’t matter if you are homeowner or a business owner, we’re residential and commercial locksmith services. Also no matter if you own apartment or a big house. In the same fashion, no matter if you own a small store, or a big offices building. Your location in the Lehigh Valley also no matter as we cover the entire area. Our professional local lock and key experts can handle any lock and locking system. From a doorknob to push bar lock, and from file cabinet lock to machinery lock, we can replace any lock, and all locks. When you want to make sure your property is secured and you’re safe, you better call a local professional locksmith in Easton, PA. Don’t hesitate to call us and expect one of our locksmiths to arrive within 20 minutes. 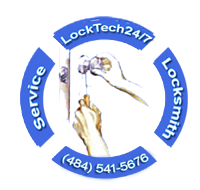 LockTech24/7 locksmiths are here 24 hour a day, 7 days a week, including weekends and high holidays. Awesome customer service. Received a call back in less than 10 minutes, in my driveway in 30 minutes, and finished in under an hour! Very pleased and would use again. Locksmith is reliable and trustworthy. His approach is customer centric with a respectful demeanor. I've had this guy come to my house twice so far. He's very good at what he does. Outstanding professional locksmith services. Josh is the man, he came out within 15 minutes and made my car key on the spot. I will definitely recommend him to all my friends and family. Thank you Josh. Called because of power outage and our two large dogs were stuck in house. I called and within 25 minutes he was at our house. Had to drill out the existing lock but was awesome enough to install a new one! Excellent price and took his business card as I will undoubtedly lock myself out again! Must use for all lock smithing purposes. I am very thankful for Joshua and locktech 24/7. He drove 40 miles to me when another locksmith company was unable to help. He was kind, professional and was able to help me get in my car in no time. I would recommend this service to my family and friends. Thanks for the work! Josh was great!!! Called him and he was here within 10 minutes. Great price, customer service and very friendly personality!!! If you ever need a locksmith, he is the one to call. Highly recommend! !